A giant in the blues world, B.B. King has died in his Las Vegas home. After collapsing during a concert in Chicago last October, the 89-year-old was hospitalized for dehydration and exhaustion. Since then he has suffered ill health with a diabetes-related illness. B.B. King had been in hospice care in his home where he passed away peacefully in his sleep on Thursday, May 14. The son of a sharecropper, Riley B. King was born September 16, 1925, on a plantation near Itta Bena, MS. He left school after grade 10 to make a living driving a tractor and picking cotton for 75 cents a day. His preacher uncle taught him to play guitar but it wasn’t until basic training in the Army in World War II when he began playing and singing the blues. Riley sang gospel songs on a Memphis street corner until he got a job at 23 at radio station WDIA as a disc jockey nicknamed “Beale Street Blues Boy.” In addition to a steady gig, it gave him access to a wide range of records in the station’s library. 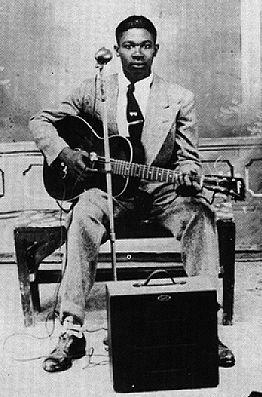 King studied the music of guitar greats like Robert Johnson, Django Reinhardt, and T-Bone Walker. While playing local clubs at night, he first recorded four sides at Bullet Records in 1949 and his 1951 record Three O’Clock Blues became a top seller. His heartfelt vocals and wailing guitar would be the centerpiece of a string of hits including My Lucille, Sweet Little Angel, How Blue Can You Get, The Thrill is Gone, and many more. From 1950 to 1970, B.B. King was always on the road and never home. He travelled an average 300 days a year and spent the rest of his time in the recording studio. (In recent years, he reduced his days on the road to 100.) Over several decades in the music business, he won 15 Grammys and sold more than 40 million records worldwide. 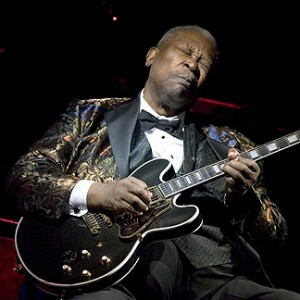 King was inducted in both The Blues Foundation Hall of Fame and The Rock n’ Roll Hall of Fame. If you are heading south from Memphis along the Mississippi Blues Trail, the impressive B.B. King Museum in Indianola, MS is a shrine for blues lovers. The museum not only profiles King’s life and career, but showcases many other blues artists from the Delta. Every year for the past 40 years, Mr. King returned to Indianola to perform for his hometown. This year’s annual B.B. King Homecoming Festival will be held in his honor at the museum grounds on Sunday, May 24th, 2015 at 2:00 pm. There’s little chance of that. May his music last forever.